I often write about my personal experience growing up with dyslexia in the 1960s. Thankfully, decades later, much more is understood about dyslexia and many more resources are available. Indeed, now there are real solutions available. It has been clearly demonstrated that evidence-based literacy instruction (an explicit multisensory approach) benefits all children—especially dyslexic children. Evidence-based means that the teaching method is reliably proven to be true. The explicit multi-sensory program was studied and validated by researchers not involved with the program. This is key: they do not make a profit from the results of their research. Evidence-based is different from being research-based—anything can be researched, often with little to no forthcoming solutions. For something to be evidence-based the results must be valid, reliable, better than other comparable programs, and published in peer-reviewed journals. Tragically, despite such advances in our understanding, a staggering 66% of students still fail to reach grade proficiency in reading by the 4th grade. And without remediation, it gets worse: many adults now in prison fall within this group. A Study of the Texas Prison System revealed that 80% of inmates are functionally illiterate, and 48% of those incarcerated are dyslexic, in contrast with 20% of the general population. This situation is not unique to just one state but occurs with alarming frequency throughout the world. Why are so many kids still falling through the educational cracks when accessible information is out there? One big reason is that in many schools, little has changed about how children are taught to read. The majority of educators still lack a solid understanding of dyslexia. Because of this, many dyslexic children are not being diagnosed, which means that zero intervention is provided during the critical early years. Even 50 years after I started school, I still see countless children struggling with the same things I struggled with, despite the diligent efforts of their parents and caring teachers. This was the experience of Jeffrey and Jasmin Dean and their oldest son Jonah in the central Texas area. They experienced over three years of frustration trying to help Jonah since he started school. Jonah’s experience reminds me of my own story. He is now getting the help he needs and the Dean family is working hard to advocate for other families that are going through the same thing. From Jonah’s mom, Jasmin: My family’s story is not unique, but it’s new to us. After 2 years of Pre-K, and grueling Kindergarten–3rd-grade years, we learned in March of 2017 that our oldest son, Jonah, has dyslexia. It was the most wonderful and heartbreaking news. Wonderful because we now had a name, difficult because we knew nothing about dyslexia and realized the struggle should have been met with early identification. Every parent/teacher conference followed a similar pattern: Your son is so wonderful, kind and compassionate, but….his phonics are questionable, he can’t read, have you considered medication, he just needs to try harder. I met with each teacher regularly throughout the year to see how I could support her at home in teaching my son. This resulted in hours of time spent working together at our dinner table. I kept hearing that if he scored poorly enough, he would be referred to the campus-wide reading specialist, but, except for a low first quarter grade in 1st grade, he never really did score poorly enough. I began to think the reading specialist was an urban legend. He did participate in early screeners. All claimed he was “developed,” and we just kept trudging through. In all those conferences, no one explained that the screeners flag kids at risk for dyslexia. In all the PTA meetings I attended, discussing the all-too-common problem of dyslexia was absent from all agendas. We had no idea as parents. In first grade, he developed extreme test anxiety. We just couldn’t understand why he was panicking before school, spending hours in the bathroom, and stopped eating for 4 months. In second grade I learned from his teacher that he would panic every time he saw the stopwatch for fluency tests. In third grade, I was told he was fine, just needed to work harder, and after our 504 meeting, the teacher tried to prove the rest of the year that he really wasn’t dyslexic. The night before he took his first official STAAR test (State of Texas Assessments of Academic Readiness—yearly exams given to measure student achievements of grade-specific academic milestones) he started crying. He told us that in 2nd grade the guidance counselor told him that he would fail the 3rd grade if he didn’t pass the STAAR test. He was an A/B student with almost perfect behavior across the board. We had no idea he was told such things until the fear and anxiety was embedded. I am including these details to emphasize the gross need for teacher training and true understanding of dyslexic symptoms. After a full day of 3rd-grade mock STAAR testing, and by the teacher’s request, another 4-hour evening of STAAR practice, I thought my son’s spirit was about to crack. With weary eyes, he looked at me and said, “Thank you, Mom, for sitting with me and doing all this.” That evening my husband and I reached our breaking point and asked that he be tested by the reading specialist. Alas, we met the reading specialist. She spent hours with us. She spent hours with Jonah. At the 504 meeting (a meeting to determine if a student has a learning disability and if so, how the school will provide support and services to that student), she gave written evidence of all we had known. We just didn’t know what it added up to. The main classroom teacher’s contribution to the 504 background information was minimal and unrelated to all the issues we shared with her and she knew Jonah struggled with academically. We included all that we had experienced, not knowing that these symptoms we observed really did add up to something concrete. We later learned it was called dyslexia. After the diagnosis, we were desperate for information. Our reading specialist led us to the Shaywitz website and book (Dr. Sally Shaywitz, coordinator of the Yale Center for Dyslexia & Creativity). We found the DVD version later. But what we were craving was a clearinghouse of information that would educate us as well as be a definitive resource for teachers. 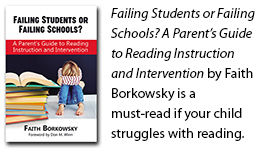 Despite the dyslexia handbook and yearly district-mandated training, there is a disconnect for many educators when it comes to dyslexia. Before the official diagnosis, we passed through so many “experts in teaching,” and not a single one recommended that he be put on the tier (see note below) or evaluated for something we didn’t really know about. Learning is magical no matter what obstacles one may have to overcome. The teacher in the classroom should never be the obstacle, but the vehicle by which all children learn. Seeing that this learning disability does not discriminate between gender, class, or creed, and one in five students has it, we have to do better for our children. Note from Don: Response to Intervention (RTI) is a multi-tier approach to the early identification and support of students with learning and behavior needs. The RTI process begins with high-quality instruction and universal screening of all children in the general education classroom. The needs of these students are identified through the assessment process, and instructional programs are delivered that focus on their specific needs. Instruction is provided in smaller groups than Tier 1 is (which would be all children in a teacher’s classroom). Jonah’s dad writes: We repeatedly asked for help, guidance, and new strategies for reading and were repeatedly told by his teachers that our son needed to “try harder.” As a result, his brain was in overdrive all day in school using incorrect strategies, and then we pushed him for hours with homework after school. This led to frustration, and often tears, on the part of our son and ourselves, with no relief in sight. When my wife asked for him to be formally tested for dyslexia (after screening negative) the reading specialist found him to be “positive” in all major categories of testing. I initially reacted with anger. I felt as though we had taken our child to professional educators 180d/yr for 3.5 years and were told he was “fine.” We KNEW he wasn’t “fine” and we kept asking until we finally made it to our reading specialist who has been wonderful. I am an Orthopedic Surgeon, which has caused me to compare dyslexia screening with the mandatory school screening of scoliosis. Scoliosis has a prevalence of 1:50 children, while dyslexia has been published, by Dr. Sally Shaywitz at Yale, to have a prevalence of approximately 1:5 (10x higher than scoliosis). Scoliosis screening is mandatory because early intervention leads to improved outcomes in children and the dyslexia literature is now showing the same. What if someone brought their child to an orthopedic surgeon’s office 180d/yr for 3.5 years saying something doesn’t seem right and were constantly told the child is “fine.” Then, out of frustration, the parents demand a CAT scan and it shows a large bone tumor. That would be a giant malpractice case. In medicine, we often use this phrase to educate young doctors about certain conditions… “YOU may not have seen IT, but IT has seen YOU.” Based on dyslexia’s prevalence of 1:5, I would suggest that teachers ought to be challenged to look for dyslexic students at an earlier stage and to help get them early intervention for better outcomes. I don’t want to dwell on the past, but I do want to help ensure that other children do not fall through the cracks. My desire is to see more robust screening, more teacher education, and more reading specialists in EVERY school. I’d like to thank Jeffrey and Jasmin Dean and Jonah for sharing their story. If you are experiencing similar challenges with your child, what can you do? Talk to the school’s counselor or principal about getting your child tested. If testing isn’t offered through the school your child attends, your child’s pediatrician can recommend a testing facility. In Jonah’s case, all of the TPRI (a reading assessment test usually administered in kindergarten) screeners claimed he was developed when he was tested in kindergarten, so he wasn’t flagged for more screening, or a real test with the specialist. The specialist diagnosed him with dyslexia the first time she tested him. Many parents have concerns, but they trust the TPRI screening. If your instincts tell you that your child has a serious problem with reading, it doesn’t hurt to ask that he or she be retested. Ask your child’s school administration about the availability of a reading specialist. Reading specialists are teachers who have the extra education to help struggling readers. They don’t typically work with children who are in special education, but rather work within the classroom, one-on-one or in small groups, with the dyslexic or other struggling readers. Joke books: a good joke is all about timing, so kids need to read their jokes several times and practice their delivery. Linking reading to making other people enjoy a good laugh is a good way to reframe the struggle to read and practice fluency. Reading books on a screen is just as valuable for your child as reading traditional books. If you have a tablet, treat him to downloaded books. Sometimes, just the difference in format is different enough to engage a reluctant reader. Many parents have reported noticing great progress in their struggling reader’s efforts by pairing an audio book with a digital or print book that the child can follow along with as they listen. Cook together. The two of you can look in cookbooks you may have around the house, get some from the library, or search the internet for ideas that sound yummy. Have your child read the recipe to you and participate in the meal preparation. You’ll spend quality time together, and your child will get to practice reading, comprehension, and especially sequencing, which is often a big challenge for dyslexics. Model fluent reading: read daily with your child from books that engage their imagination. And ask questions as you go: “What do you think will happen next?”, “What would you do if you were this character?”, “What do you think the character is most afraid of?” to determine gaps in comprehension. Explain as needed so the child remains fully engaged. Note your child’s current interests, and plan activities together around those. If they’re really into trains right now, or tadpoles, or ponies, read books about those things. Field trips are an excellent way to capitalize on a child’s interests. If you’re going to museums or touring facilities that offer learning experiences, reading is frequently part of the experience and can be paired with hands-on opportunities for a multi-sensory approach. Recognize and praise effort: dyslexic readers have to exert massive amounts of effort to show up for their day and do their assignments. Saying things like, “Look how hard you’re working! I’m so proud of you!” can go a long way to helping your child see that you understand their struggle and appreciate their efforts. If your child is pre-school aged, see my blog Children with Dyslexia: Early Detection and Intervention about what to watch for in younger children that can point to dyslexia so intervention can begin as early as possible. Take advantage of other dyslexia resources I’ve shared on my blog. If you’re looking for a series of exciting adventure books that help reluctant readers, take a peek at the award-winning Sir Kaye series published by Progressive Rising Phoenix Press. The audio editions of the Sir Kaye books are available on Audible.com, Amazon.com, and iTunes.